TEST IT TUESDAY is back! I know it’s been awhile (uh…6 months? Longer? Who knows). But here I am posting on it again, because it’s fun to cook with new ingredients! Today’s new ingredient is bulgur, which I’ve had a package of sitting in my cupboard for months. Some of you may already be very familiar with it, and others of you may have never heard of it. Prior to purchasing it (and eating it), I had heard of it, but never eaten it or really even knew how you ate it! It is a wheat product that is common in Middle Eastern cooking (and the word itself is of Turkish origin…thanks Wikipedia!). I am inclined to lump it in with rice, quinoa, cous cous, etc. It was really good and flavourful, and it turned out not to be scary or nasty (which I must admit, I was a bit worried about). 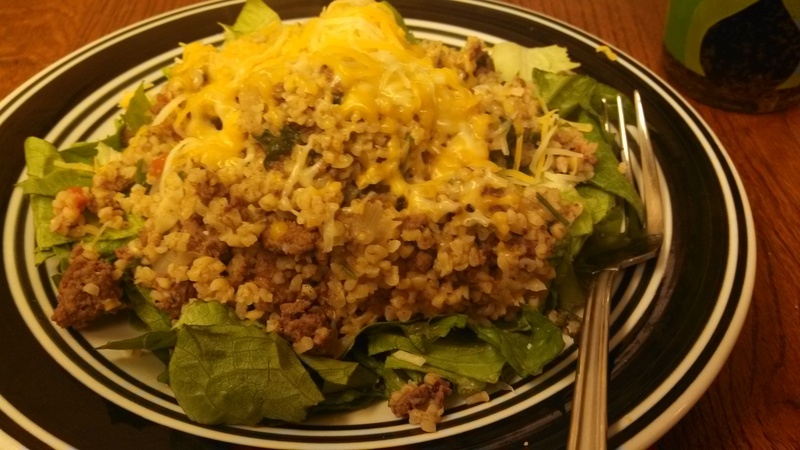 I am sure that bulgur doesn’t pop up much in Mexican cooking, however this dish is more pseudo/fusion. It rises and increases in size when cooked, like the similar food items I listed above. It’s a poor quality to have as a food blogger, but sometimes I can be bad at describing things. I can’t really pinpoint the taste, except to say it wasn’t mushy or anything like that, it had the similar qualities and looks of, again, the aforementioned food items. I would definitely recommend it to others! 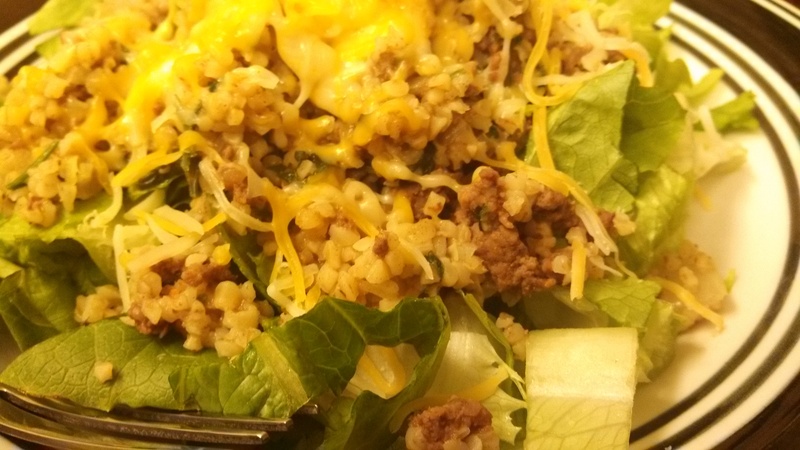 The recipe I used it in was Mexican Beef and Bulgur Salad by The Enchanted Cook. It was such a different type of meal for me to make. First of all, it was a salad. And that was the main/only course. Also, I am not the biggest fan of thick/chunky salsas or Rotel, so we didn’t even really have a dressing. But it was so filling. My husband even said it could have had MORE spice and flavour to it…even though I added Sriracha to mine (I add that to EVERYTHING), but he can’t handle the extensive heat that Sriracha gives). Regardless, it was good, and we had a ton leftover for work lunches, that kept us filled up! I must add, going back to the spice-factor, I do recommend adding salsa or Rotel (or even taco sauce, for people like me who hate the chunks). I think that omitting that is really what brought down the flavour/spice of the dish. -While bulgur is cooking according to package directions, heat a large non-stick skillet to medium high and add ground beef. Brown for about 8-10 minutes, breaking it up as you go. -Add onions, garlic, cumin, salt and pepper and stir to combine. Continue cooking over medium high heat, stirring occasionally and allowing onions and garlic to soften and become fragrant, about 3 more minutes. 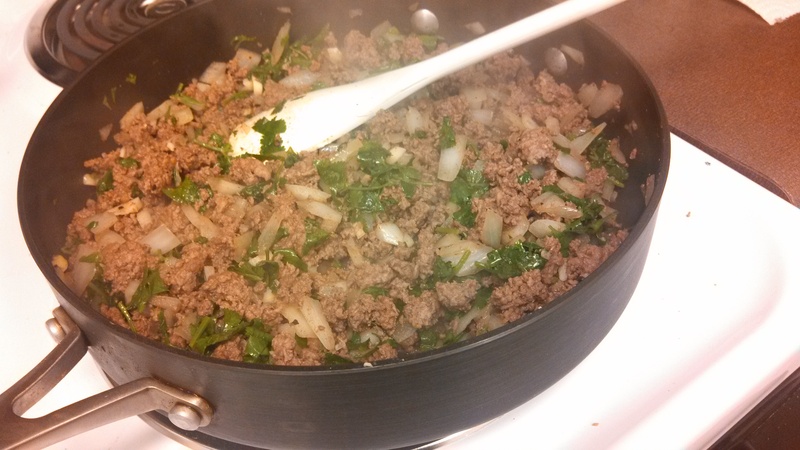 -Add entire can of RO*TEL and fresh cilantro to beef mixture, stir to combine. Reduce heat to medium. 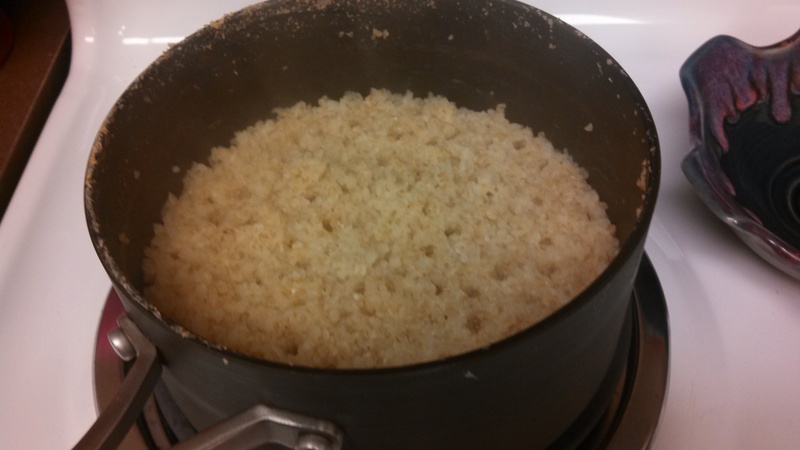 -By this time your bulgur should be ready (water fully absorbed, or drain if necessary). Add bulgur to skillet with beef mixture and stir to combine. Taste for seasoning and add additional salt or pepper if needed. -Remove from heat and serve individually over beds of lettuce. Top with cheese, sour cream, and salsa as desired.